So I signed up to ride Etape Loch Ness, a 66-mile cyclosportive around the famous lake in the Scottish Highlands. Such a pursuit shouldn't have been a big deal for me a few years ago, but in my current state of fitness it was going to be a little challenging for me. It didn't seem that long ago that I was making my first tentative steps back into cycling after my operation. I already talked about what it was like to do that first mega long bike ride to Richmond Park! I had been gradually increasing the mileage and got up to riding 30-40 miles for the rail trail rides that I was testing out for my articles on the Total Women's Cycling website. 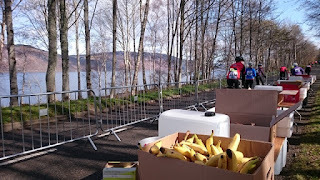 But then the bar was pushed that bit higher when I received an invitation to ride the Etape Loch Ness. 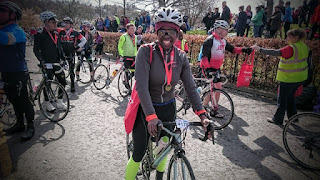 I have not done loads of cycling in Scotland even though it is an area where I would like to ride more. 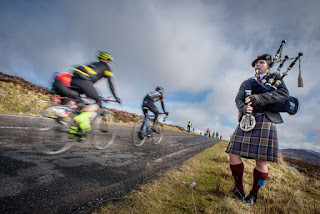 I had heard of two popular cycling events up there - Bealach Na Ba cyclosportive, and Etape Caledonian - both of which are very popular. In terms of independent cycling there my main issue had been knowing where to ride, as looking at a map there don't appear to be many quiet roads, and when to ride - it's too cold and rainy in winter, and completely plagued with midges in summer! In any case, a trip up there was the last thing on my mind as I had yet to conquer cycling around South London! So, it was quite a surprise when Eoin (pronounced Ian) from Tricker PR contacted me about participating in the event. To me it was a no-brainer. Of course! 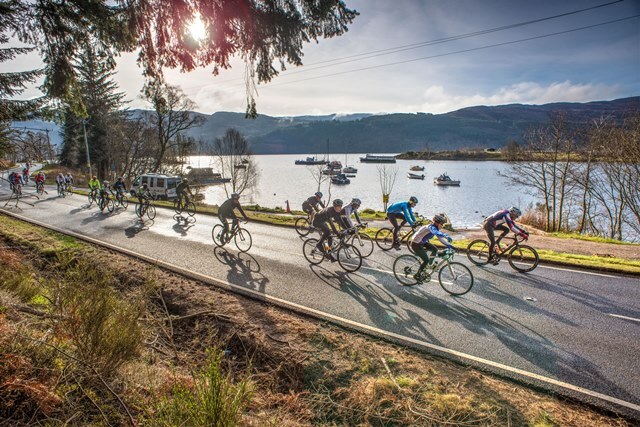 I would grab the opportunity to ride in Scotland now, and sort out my ability later! 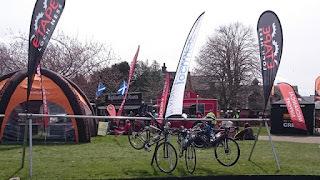 Previous events I had done in Scotland - Rachel Atherton Red Bull Fox hunt, and a triathlon at Gullane Beach - were very pleasant experiences and I have good memories of those times when I was north of border. 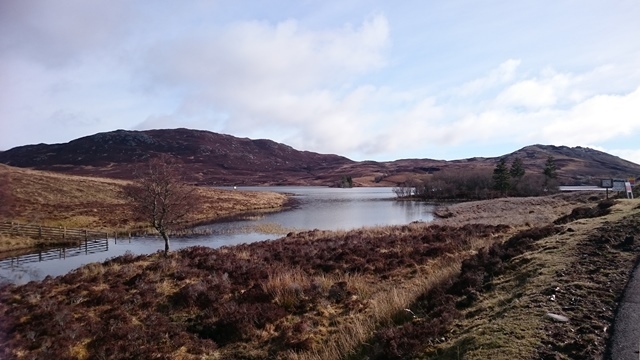 However, this trip would be a bit of departure, not least because I would be going into the wilds of the Highlands rather than places close to the Edinburgh metropole. 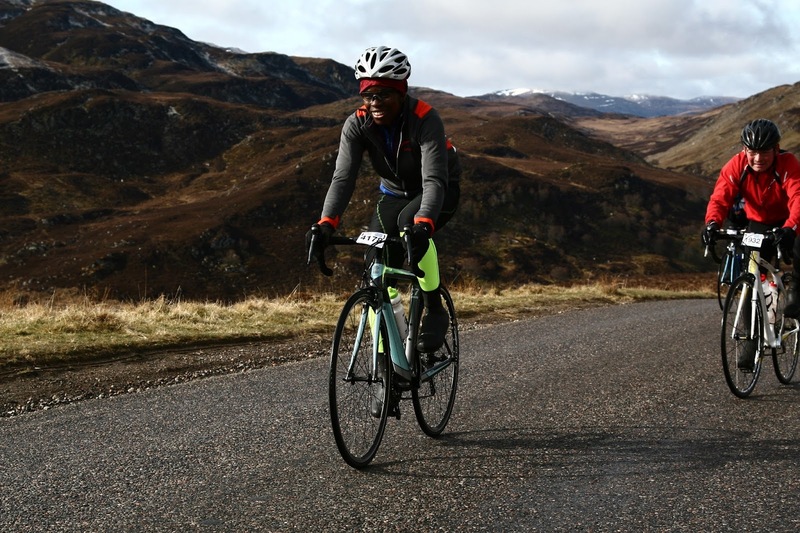 So here I was on a flight to start a 66-mile cycling event around Loch Ness, which included a big climb up a military road. 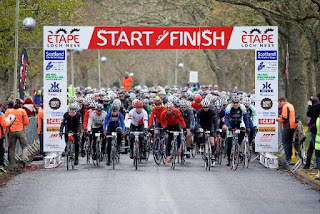 This would be my first cyclosportive in four years! As well as being slightly apprehensive about the distance, I was also worried about being overtaken by the broom wagon! I understood the maximum time to complete it would be around 5 hours 40 minutes. I had put 5 hours 30 as my estimated time - not much wiggle room! 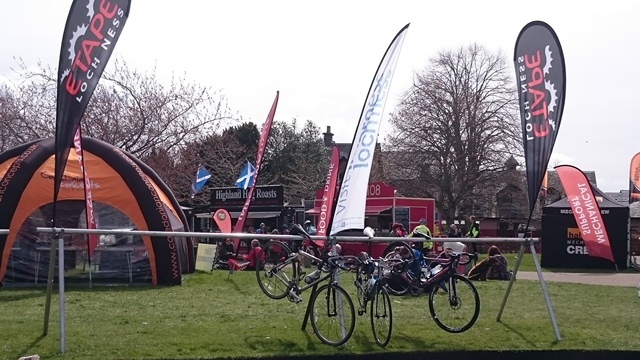 Once at the event village in Inverness, I felt happy to be among cyclists and I immediately settled into the mental frame of mind I adopt prior to a cycle event. I began to feel a can-do attitude, and I was swept along into the groove of being able to ride. I didn't really know if I would be able to get round. I may have just developed a false sense of security! I once failed to complete La Marmotte cyclosportive in France when I missed the cut-off for riding up Alpe d'Huez., and this happened despite me feeling all right during the ride, and having successfully completed this gruelling cyclosportive on two previous occasions! So after a pleasant meal with a couple of journos, both of whom looked set to complete the ride ahead of me, I went to bed thinking whatever will be. The following morning, appropriately kitted out with extra layers to deal with the Highland weather, a decent Boardman bike, kindly supplied by Halfords, lots of encouragement from the local folks, all I needed to do was to get to the startline by 6.15am and find a good wheel to tow me round - preferably by a rider who could make a big hole in the air in front of me! 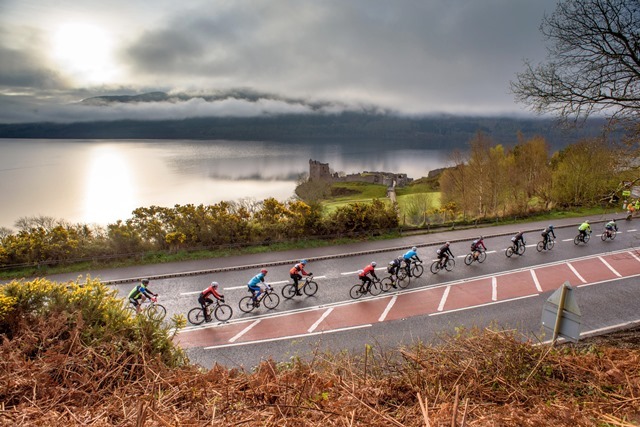 By 6.45am we were whizzing through the outskirts of Inverness and soon we were spinning along past the lake. It was great setting off in a wave of 200+ riders. In a group this large you just get pulled along by the slipstream of the group. Being on closed roads was wonderful as well. It felt relaxing, riding along in the early morning sunshine. 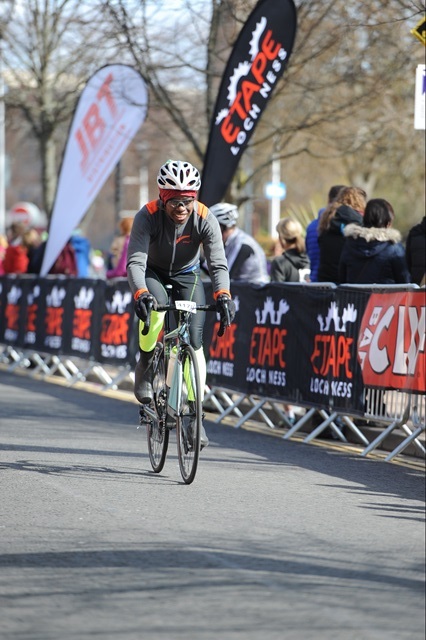 I felt like I was in a professional cycle race - albeit with 3,199 other participants. At the first feed station I felt fine, possibly a little overdressed even, particularly as the main challenge of the day came shortly afterwards - a 5-mile climb up to Glen Doe via General Wade's Military Road. This climb was pretty tough and had a lot of people walking, particularly on a few short sections where the gradient went above 16%. If you hadn't studied the roadbook beforehand you would have found it a demoralising ride as there were a few sections where the road levelled off or went downhill and then you would round a bend and suddenly the road would kick upwards again with an even tougher gradient than before! The sight of a lone piper and lots of folks cheering and clapping at the summit showed that our slog was over and I could smile at the fact that I had overcome this hurdle. Heaving a massive sigh of relief, my focus then turned to making up as much time as possible on the descent so as not to risk falling behind schedule. We managed to form a good working group, working together in a chain gang on the flat. Actually, when I say flat read that as constantly gently undulating! The route was never really flat, even when we were next to the lake, and I began to flag from all the ups and downs. Thankfully the feed station 12 miles from the end was just what I needed, with some lovely doughnuts and bananas on offer, which was good news. The bad news was I had lost my group which had decided to skip the feedstation - it was all so tempting to stay at this lovely location for the rest of the day, but hey, I had a challenge to complete! When I got going I realised my legs were heavy and tired. So it was just a case of twiddling home at a modest pace on my own and just willing myself along through the suburbs of Inverness, hoping that there would be no more hill that might make my legs conk out completely! Thankfully the run in to the finish line was generally downhill and I was able to feign a focused racing look (as opposed to a clapped-out folorn look) in front of the numerous spectators. At the finish line I had the biggest smile on my face as I found that I had taken 4.5 hours - an hour quicker than scheduled and no broom wagon was in sight, plus a realistic chance of comfortably making my flight back to London! 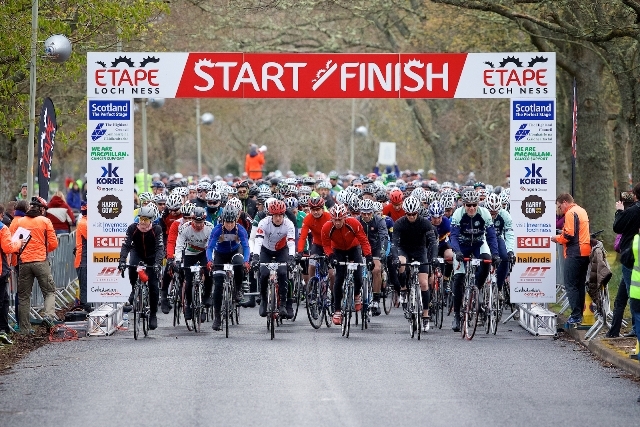 I would definitely recommend the Etape Loch Ness. You don't need to be superfast to do it (though there were people around who were!) - just ride at 12 miles an hour (which is doable in a large group), and the landscape is the most amazing you could wish for. It was well organised, and I'd say the Highland folk are wonderfully friendly. Thanks to Tricker PR and Caledonian Concepts for organising my trip, and to Halfords for providing me with a Boardman Team Carbon Fi bike. Great post, I rode it as well and thankfully we had good weather for it or it can be a different atmosphere!